Apple(s aapl) sold more than half of the smartphones in the U.S. between mid-October (just after the iPhone 5 hit stores) and the end of November, according to a new research report published Monday by Kantar Worldpanel Comtech. While Apple’s rise during one of its historically strongest periods — right after the release of a new iPhone — isn’t that surprising, it’s interesting to see how those new devices are divided among the major U.S. carriers. AT&T(s T), the U.S. carrier that’s offered the iPhone the longest, actually had the biggest year over year bump in iOS device sales. Smartphones made up 35.4 percent of all AT&T sales during the 12 weeks ending Nov. 25, inching up from the 30.9 percent during the same period in 2011. And while AT&T is selling more smartphones, it’s also selling more iPhones: its iOS device share was 71.8 percent from mid-October to right after Black Friday this year. That’s up from iOS’s 62.3 percent share during the same period in 2011. But the story was even better at Verizon,(s VZ)(s vod) on whom AT&T had an almost three year head start in offering Apple’s phone. While Verizon saw barely any change in the ratio of smartphones to all other device sales during the six-week period in October/November (31.9 percent compared to 31.3 percent in 2011), it sold more iPhones anyway: iOS devices made up 55 percent of smartphone sales for the carrier, up from the 40.7 percent during the same period a year ago. Some of Apple’s gain appears to be RIM’s loss as Blackberry(s RIMM) sales dropped off at both carriers. 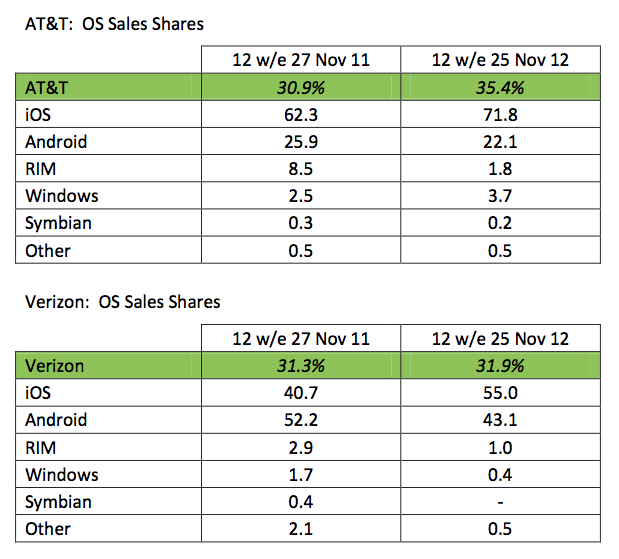 Windows(s MSFT) devices declined only at Verizon, while they saw an increase at AT&T. The remaining pickup by Apple may have come from new customers joining the carrier, or from upgrades from Android devices, which lost share year over year during that same period at both AT&T and Verizon. U.S. carriers will likely add much more detail to their overall quarterly sales during their individual earnings call later this month: AT&T on Jan. 24 and Verizon on Jan. 22. Samsung’s phone feel like super cheap plastic…and then you’re stuck with Android. What a mess. I will take Apple any day. Considering that the period in question started on September 2nd and the iPhone 5 didn’t go on sale until September 21st, Apple made these market share numbers while selling the flagship iPhone 5 for only 9 out of the 12 weeks in the period. Looking at the numbers from September 21st and onward, I would wager that Apple’s market share numbers were considerably higher, on the order of 70%. From this perspective, Apple totally dominated the entire US smartphone market during the Christmas quarter. These numbers are in the iPod / iPad market share range. Is this an anomaly or a turning point? If this Kantar data pans out as legit, and not an outlier, it will spell big things for the Android ecosystem. Samsung’s opportunity to strike out and take ownership of their platform has never been more ripe – at which point Android is pretty much doomed. RIM’s market share has been on a continual decline for months. The bottom line is that Apple dominates the upper end of the smartphone market, and the only competitor who can come close is Samsung. Even Nokia’s Windows Phones will fail to measure up to the iPhone.